You probably know or can work out what railway points do and what gauge means? But what about loading gauge? A CDU? Or a flange? 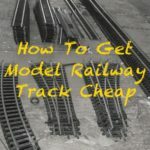 Here’s the ultimate glossary to model railways with over 154 definitions of common model railway terms, jargon, people and objects. If you know model railway phrases, jargon or buzz words not listed here please help others and add it as a comment at the end. Accessory Decoder: A chip on a circuit board that decodes signals from the command station into instructions for the accessory – changing signals; turning on lights etc. Address: A number identifying each locomotive or accessory decoder on a DCC layout enabling instructions to be sent to individual locos and accessories. Ampere or Amp: Unit used to measure electrical current strength. Analogue control: Track voltage control system used in DC (Analogue) layouts. Voltage — 0 to 12 volts — sets the speed of the train with polarity controlling the train direction. See advantages of DC train sets. 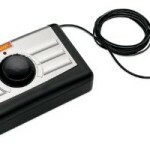 Booster: Combines the power with the control instructions in a DCC layout. More boosters are added as the layout grows, often combined with the Command Station. Bus: A single wire that runs from the controller around the underside of the baseboard and from which dropper wires connect to the track, reducing long runs cabling and providing multiple connections to the track around the layout to improve reliability. Cab: Another name for the throttle unit on DCC layouts. Command Station: The brains’ of a DCC system, micro-computer that communicates with the decoders in the locomotives or accessories. DCC: Digital Command and Control: Trains and accessories are controlled by digital signals allowing trains to be individually controlled. See advantages of DCC. Dropper Wires: Wires from rail sections to a Bus wire. Electrofrog: A type of point where electricity passes through all tracks. Insulfrog: A type of point where the electricity can only pass one way through the points, isolating the other track. Locomotive Decoder: A chip on a circuit board inside locomotives that decodes signals sent from command station and converts them to actions on the loco – stopping, starting, accelerating and slowing down. Ohm: The measurement of the resistance in an electrical circuit. Rectifier: Converts AC current to DC. Resistance: A measure of the difficulty of passing an electric current through a conductor. Return: The place where a connection is made to the track to allow current to flow back to the controller. In model railway terms this is called the negative. Solenoid: Converts an electrical charge into mechanical movement using magnets to provide a turning, moving or clamping action. Often used as point motors. Terminal Block: Used join wires without soldering, two or more wires pushed into a hole and held in place with a screw. Throttle: The operator controls on a DCC layout, typically a box with a knob and buttons allowing the locomotive to be selected and its speed to be set. Transformer: A device designed to change the voltage of an A.C. supply. Transformers are often used to power accessories on a layout. Volt: A unit of electrical pressure. Watt: A unit of electrical measurement to describe the energy produced. A watt is the number of volts multiplied by the number of amps. Backscene: A painting or photograph hung at the rear of a layout to create the impression of depth. Baseboard: A wooden board on which tracks, scenery and other elements of a model railway are placed. End-To-End: A type of layout where trains run from one end to the other. Trains will need be EMU/DMU or turned before returning, see Fiddle Yard. Fiddle Yard: Area of track hidden from view on a model railway where trains are stored and operated to provide realistic operation on the viewable areas. See The ABCs of Fiddle Yards. MDF: Medium Density Fiberboard, a wood composite material used for baseboard construction. Tough and durable. Plywood: Sheets of material made from slices of wood glued together. Used for the top layer of baseboards. 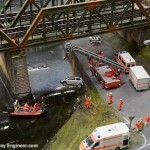 Scenery: The natural elements of a landscape in a model railway — hills, rivers, fields, etc. Scenic Break: A way of dividing up a model railway to make it look as if two or more sections are further apart than they actually are. Track Plan: A picture showing the track arrangement on a layout. Brunel: Isambard Kingdom Brunel (1806 – 1859), the engineer and personality behind the Great Western Railway. Bulleid: O.V.S. Bulleid (1882 – 1970), the last chief mechanical engineer to the Southern Railway. Chief mechanical engineer: The man in charge of designing locomotives, coaches, determining technical standards, for Britain’s railways. Churchward: G. J. Churchward (1857 – 1933), a chief mechanical engineer for Great Western Railway from 1902 to 1922. Collett: C. B. Collett (1871 – 1952), a chief mechanical engineer for Great Western Railway from 1922 to 1941. Craven: John Chester Craven (1813 – 1887) – Chief engineer for LB&SCR from 1847 to 1870. Fowler: Sir Henry Fowler (1870 – 1938), a chief mechanical engineer to the LMS from 1925 to 1933. Gooch: Sir Daniel Gooch (1816 – 1889), Superintendent of Locomotives for the early GWR from 1837 to 1864. Gresley: Sir Nigel Gresley (1876 – 1941), a chief mechanical engineer to the GNR and LNER 1911 to 1941. Designed the A3 and A4 class (Flying Scotsman and Mallard) steam engines. Ivatt: H. A. Ivatt (1851 – 1923), a chief mechanical engineer to the Great Northern Railway from 1896 to 1911. Maunsell: R. E. L. Maunsell, a chief mechanical engineer for the Southern Railway. Peppercorn: Arthur Peppercorn (1889 – 1951), last Chief Mechanical Engineer of the London and North Eastern Railway. Responsible for the popular A1 and A2 class express locomotives. Stroudley: William Stroudley (1833 – 1889) chief engineer of London, Brighton and South Coast Railway. Trevithick: Richard Trevithick (1771 – 1833). An early pioneer of steam power. Acrylic Paint: Water based paint, fast drying. Airbrush: A paint sprayer used by artists and model builders to give a controlled application of paint. Dry Brushing: A technique where a brush with almost dry paint is used to highlight raised details on models. Epoxy Glues: A very strong two-part adhesive used to glue different materials – plastic, wood etc. Most commonly known under the trade name Araldite. Foam board: Board made by sandwiching a layer of foam between layers of thick paper to give a strong but lightweight material. Used for model construction. HO scale: Models to a scale of 1:87, 3.5mm to 1 foot. Kit Bashed: A model made using parts from different kits to make a different or unique model. Kit Built: A model built entirely parts supplied in a kit. N Scale: Models to a scale of 1:148 (in the UK), 1.90mm to the foot with track 9mm wide. O Scale: Models to a scale of 1:43.5 (UK), 1:48 (US); 6.35mm to the foot. OO Scale: Models to a scale of 1:76, 4mm to 1 foot . 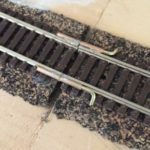 009 Scale: A scale and gauge for modelling narrow gauge railways with a combination of 4 mm scale and 9 mm (0.354 in) gauge tracks. Plasticard: The UK name for styrene sheets. Polystyrene Cement: A glue used for much plastic modelling; welds plastic together. Prototype: The original on which a model is based. PVA: (Polyvinyl acetate) A glue most commonly used as wood glue, usually white in colour. Also used for other materials on model railways, including ballast when watered down. 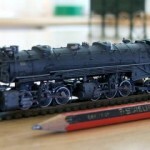 Scratch-built: Making models from parts you have made, or mostly made, yourself. Scatter Material: A material used to create ground cover – soil, ballast, grass etc. Made from sawdust, wood chips or ground foam. See static grass. Scribing: Using a pointed blade to mark out detail – brick or stonework etc – on a modelling material (clay, plaster etc) to create a relief effect. Static Grass Applicator: A tool to apply static grass, making it stand up. Static Grass: Used to simulate grass; short threads of material that stand up when static is applied, giving the look of grass. Gives a more realistic grass look than scatter material. Styrene Sheet: A strong durable plastic sheeting, easy to cut and shape when heated. Wash: A very thin coat of paint – almost transparent – of darker colour than the underlying colours applied for shading etc. Weathering: Painting and adding effects to models to make them appear used and old and hence more realistic. Z scale: Models built to a scale of 1:220, 1.39mm to 1 foot, the smallest commercially available scale of model railway.Review of a Z scale starter set. Bogie: The movable wheel assembly unit on rolling stock connected to the underframe by means of a pivot. Boiler: The long large cylinder making up the bulk of a steam engine, contains the pipes etc through which water passes for heating.Bunker: A space at the rear of a tank engine used for coal storage. Brake Van: An vehicle at the end of a goods train, in which the guard rides. Deltic: A Class 55 diesel locomotives operated by British Rail from the 1960s to the 1980s. Visit Deltic Preservation Society for more details. DMU: Diesel Multiple Unit. See EMU but diesel powered. Double Heading: Having two or more locomotives at the front of a train to provide more haulage power. Driving Wheels: The powered wheels of a steam engine, attached to the pistons. EMU: Electrical Multiple Unit. A train of coaches, the end units having a cab allowing the train driven in both directions. See DMU. Flying Scotsman (pictured): An LNER Class A3 4472 Pacific steam locomotive. Designed by Nigel Gresley for LNER. Holds two records: the first steam locomotive to officially reach 100 mph (30th November 1934) and the longest non-stop run by a steam locomotive – 422 miles – on 8th August 1989. Flanges: The projection/lip on railway wheels, which keeps them on the track. Mallard: LNER Class A4 4468 steam locomotive, designed by Sir Nigel Gresley for LNER. Holds of the world speed record for steam locomotives, 125.88 mph in 1938. Pannier Tank: A type of tank engine with long rectangular tanks on either side of the boiler. See saddle tank engine. Pantograph: Folding current collection device mounted on the roof of trains operating with overhead power supply. Private Owner: Usually a wagon or van owned by a private non-railway firm. Rake: A group of coaches coupled together to form a train. Saddle tank: A type of tank engine in which the water tanks are draped over the boiler. See Pannier tank engine. Shunter: A small engine used for assembling trains and moving Wagons and freight cars around. Stanier: An engine or coach designed by Sir W. A. Stanier, a chief mechanical engineer to the LMS. Tank Engine: A small steam loco that carries its own fuel and water instead of having a tender. The water tanks on either side of the boiler. Tender: Rolling stock coupled behind larger steam engines to carry coal/water. Tornado: Peppercorn class A1 Pacific steam locomotive built and first run in 2008. Visit A1 Steam for further information. Wagon: Freight car in North America. A railway vehicle designed to carry only goods and usually open at the top. Wheel Base: The distance between the points where the wheels contact the rails. Big Four: Four large train companies formed on 1 January 1923 by the grouping of other railways. The four consisted: Southern Group; Western Group (GWR); London, Midland and Scottish Railway (LMS); London and North Eastern Railway (LNER). BR: British Railways; later British Rail. Formed by the nationalisation of the Big Four in 1948. 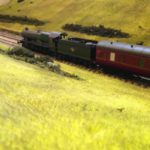 British Railway Modeling Standards Bureau: A standards group defining standards and dimensions for model railways. Eastern: Eastern Region (of British Rail), created with the nationalisation of the Big Four in 1948. Grouping: Name given to the Railways Act of 1921 which saw railway companies of the UK merged into the Big Four. Grouping came into effect on 1st January 1923. GCR: Great Central Railway, formed in 1897 when the Manchester, Sheffield and Lincolnshire Railway was renamed. Became LNER in 1923. GER: Great Eastern Railway, formed in 1862 becoming part of LNER in 1923. GNR: Great Northern Railway, formed in 1846 becoming part of LNER in 1923. GWR: Great Western Railway (1833–1948) becoming Western Region of British Railways in 1947. L & Y: Lancashire and Yorkshire (Railway), incorporated in 1847. Merged with LNWR in 1922 and merged into LMS in 1923. LB&SCR: London, Brighton and South Coast Railway (1846 to 1922). Merged with L&SWR and SECR form the Southern Railway in 1921. LMR: London Midland Region (of British Rail) – created by the formation of the nationalised British Railways (BR) and consisted of ex-London, Midland and Scottish Railway (LMS) lines in England and Wales in 1948 to 1992. LMS: London, Midland and Scottish (Railway) 1923 – 1948. Formed from merger of London and North Western Railway, Midland Railway, the Lancashire and Yorkshire Railway in Railways Act of 1921. LNER: London, North-Eastern Railway, second largest of the Big Four railway companies created by the Railways Act 1921 in Britain. Nationalised into British Railways in 1948. LNWR: London and North Western Railway, created by the merger of three companies – the Grand Junction Railway, the London and Birmingham Railway and the Manchester and Birmingham Railway in 1846. Became part of LMS in 1921 and in 1948 the London Midland Region of British Railways. LSWR: London & South Western Railway 1838 to 1922. Merged with LB&SCR & SECR to form Southern Railway in 1923. North Eastern: North Eastern Region of British Railways, formed from LNER in 1948. Merged with Eastern Region of British Railways in 1967. S&DJR (S&D): Somerset & Dorset Joint Railway, formed in 1862 in a merger of smaller lines merged into LMS and Souther Railway in 1923. SECR: South-Eastern and Chatham Railway – merged with LSWR & LBSCR to form Southern Railway in 1923. Southern: Southern Railway formed 1923 with the merger of LSWR, LBSC & SECR. Nationalised in 1948. Western: Western Region (of British Railways). Aspect: The visual appearance of a signal, the main UK signal aspects being: Green, Double Yellow, Single Yellow, Red. Ballast: The trackbed on which railway sleepers sit, made from crushed rocks. Block: A section of track protected by signals. In DC model railways, blocks are sections of track in which trains can be operated independently from neighbouring blocks. Branch Line: A section of railway that leaves the main line to serve a town or industry. Broad Gauge: Railway tracks wider than standard gauge and narrow gauge. Buffers: Barrier’s installed at the end of a dead-end track to stop trains going further. Bullhead Rail: This is rail having the same profile for upper and lower portions of the rail. Catenary: Overhead wires and the support for carrying electricity above the railway, see Pantograph. Crossover: Two turnouts arranged in a pair to allow a train to cross from one line to another. Culvert: A passageway under tracks for drainage of water. Cutting: A route cut through terrain allowing the train to pass without an incline or tunnel. See how to make cuttings. Distant Signal: A signal giving notice of the next signal but has no stop indication itself. Down: The direction on track away from London or railway company HQ. See Up. Embankment: A bank of earth or stone built to carry railway track over the low ground. EM Gauge: Trains to OO scale but track and axle width to a wider – more realistic – 18.2mm. See What is EM Gauge. Fishplates: A plate, usually metal in model railways, that joins rails. Flexi-track: Track that can be curved and cut to fit a track plan. Frog: part of a switch – the part where the two tracks diverge. Gauge: The width between the inner faces of the rails. Goods Shed: A shed with a platform allowing goods to be loaded into vans. Ground Frame: Levers – possibly a small signal box – used to control sidings. Incline: A gentle slope allowing locomotives to pull trains up and down hills. See how to build inclines. Loading Gauge: The horizontal size limit of trains on a stretch of the train so that locomotives and rolling stock can pass by without coming into contact with anything. Loop: A line that runs alongside another line to which it is attached at both ends allowing a train to pass another. MPD: Motive Power Depot, the servicing depot (usually including engine sheds, water and coaling facilities and turntable). See TMD. Narrow Gauge: Track with a gauge of 1 ft 11 5⁄8 in to 3 ft 6 in. See standard gauge & broad gauge. Reverse Loop: A line which curves around and is attached back to itself to allow trains to be turned. Semaphore Signal: A signal using a moving arm to indicate status. 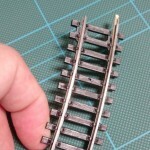 Siding: A single piece of track attached to a mainline. Sleeper: Railroad tie in America. Holds rails upright and keep them spaced to the correct gauge; laid perpendicular to the rails, transfer loads to track ballast. Standard Gauge: Railways built to a gauge of 4′ 8.5″, used first in the UK and now common around the world. TMD: Traction Motive Depot, the modern equivalent of MPD – servicing and storage of electric and diesel locomotives. Up: The direction on track towards a usually capital city (London) and/or railway company headquarters. Upper quadrant: A semaphore signal where the arm is raised mechanically show that the line ahead is clear. Viaduct: A structure used to carry railway tracks above the general level of the ground. Vertical clearance: The height required for trains to pass through tunnels and bridges. See my article what are the minimal vertical clearances. Y point: A point or turnout shaped like the letter Y.
Zig Zag: A track arrangement used to climb and descend steep gradients. 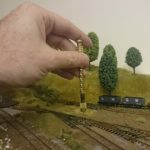 Should ‘narrow gauge’ and ‘standard gauge’ be the same (4′ 8.5″)?